If guests are lucky, they will be able to catch a glimpse of Grand Solmar Timeshare‘s resident wild mascot, Poncho the Sea Lion. These beautiful animals can be found throughout Cabo San Lucas, especially around El Arco, which is extremely close nearby to Grand Solmar Timeshare’s incredible resort. 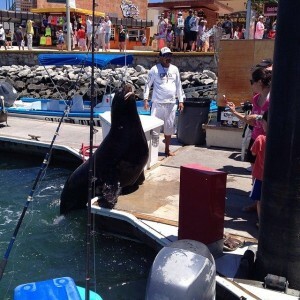 When taking a boating trip with the Grand Solmar fleet, it is not uncommon for Poncho and his other sea lion friends to catch a ride on the boats coming back to the Marina. Keep an eye out, though, as they are known to snag a quick snack or two or your catch! While these animals are friendly, it is important to never pet them as they are still wild animals. Visit Grand Solmar Timeshare today for the chance to see Poncho and his furry friends!